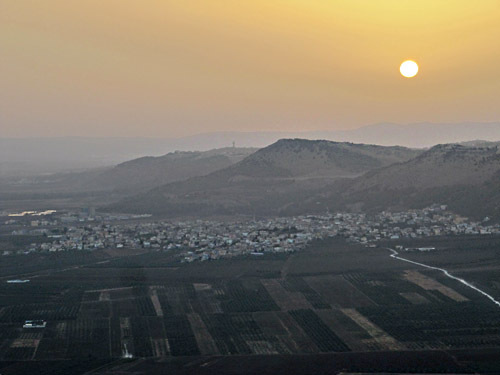 Mount Tavor, also known as Mount Tabor or Har Tavor in Hebrew, is one of the Lower Galilee’s most amazing sites. Also known as the Mount of Transfiguration, the location where Jesus becomes radiant in glory (Matthew 17:1-8), is a mount that rises up in the plains of the Jezreel Valley. Because of its high elevation (1,890 ft.), it is ideal to watch the sunrise over the distant Golan Heights or to experience the gorgeous panoramic sunsets. Not only does Mount Tavor have a strong Christian connection, it was also known as one of the main beacon-lighting points during the days of the Second Jewish Temple, when fires were lit to announce the holy days to surrounding villages. However, because of the legendary account of the Transfiguration, Mount Tavor has been primarily a place of Christian pilgrimage, ever since the 4th century. Many churches and monasteries have come and gone on the top of the mount, but currently, there are two Christian monasteries at the peak, one Eastern Orthodox (in the northeast) and the other Roman Catholic (in the southeast). The rather more impressive Church of the Transfiguration (the Roman Catholic church) is the one most often frequented by visitors. You can easily reach each one by road (the road forks into two at the summit, with each road leading to a different church). Located on Road 65 about 11 miles west of the Sea of Galilee, Mount Tavor is unmissable for those driving north from Tel Aviv to the Sea of Galilee. To reach the peak, head north on Road 65 and take a left at the Arab village of Shibli, just before you get to Kfar Tavor. Drive through the village until you reach the main car/coach parking area. From here you can continue by car to the summit (it’s not possible by coach/bus, though there are a fleet of minibuses ready to take you up to the top), or be more adventurous and take the hike (take plenty of water with you, it will take a couple of hours!). There are a number of great events in the area, although the two standout events have to be the Tabor Festival, which takes place around April/May and features a number of events for all the family, and the Feast of Transfiguration, a festive mass that since the 9th century has been held in August at the Church of the Transfiguration. If you’re looking for something a little special, how about a visit to the nearby Mount Tavor Brewery, which offers some great little tours of their mini-brewery and locally brewed beers. Tours include tasting, and the range of beers produced by Mount Tavor Brewery are pretty tasty! Originally posted at I Googled Israel.